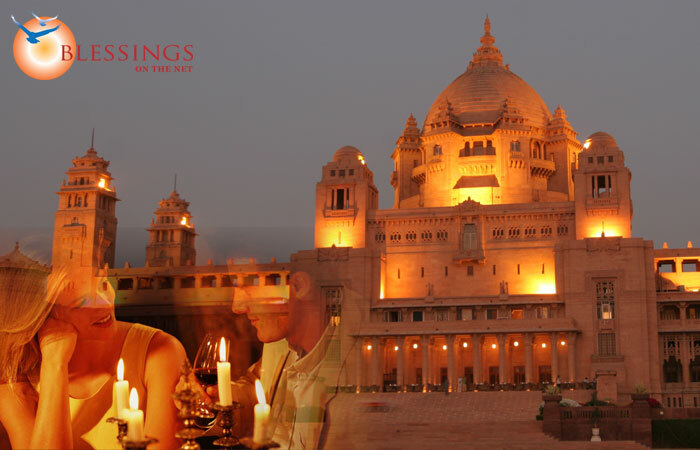 Rajasthan 'The land of Kings' comprises of the Thar desert, also known as the Indian desert. Though a large percentage of the total area is desert, and even though there is little forest cover, Rajasthan has a rich and varied flora and fauna. 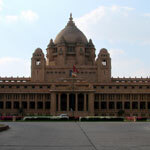 Rajasthan is also noted for National Parks and Wildlife Sanctuaries. There are four national park and wildlife sanctuaries named the Keoladeo National Park of Bharatpur, Sariska Tiger Reserve of Alwar, Ranthambore National Park of Sawai Madhopur, and Desert National Park of Jaisalmer..
Day 1. Pickup from Jodhpur Airport / Railway Station. Proceed to the hotel and check in. Relax in the afternoon. 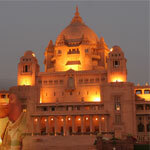 In the evening visit Local Market and Mehrangarh fort, and Jaswant Thada . Overnight stay in a room specially decorated for the couple. Day 3. Today, you proceed towards the heart of Thar desert, to the citadel of Jaisalmer. Enjoy the remaining day at leisure and spend time with each other. Enjoy local folkdances late in evening. Day 4. After breakfast, visit the Jaisalmer Fort situated on top of the Trikuta Hill, enclosed by 99 bastions. In the evening, you will drive to Sam to visit the Sand Dunes. Enjoy the camel safari and then return to the hotel for a night stay in Jaisalmer. Day 5. Enjoy the day at leisure. In the evening take a ride on the camel cart to visit the sunset point. In the evening, enjoy participating in the fold dance around the bonfire. Pickup from Jodhpur Airport / Railway Station. Proceed to the hotel and check in. Relax in the afternoon. In the evening visit Local Market and Mehrangarh fort, and Jaswant Thada . Overnight stay in a room specially decorated for the couple. Today, you proceed towards the heart of Thar desert, to the citadel of Jaisalmer. Enjoy the remaining day at leisure and spend time with each other. Enjoy local folkdances late in evening. After breakfast, visit the Jaisalmer Fort situated on top of the Trikuta Hill, enclosed by 99 bastions. In the evening, you will drive to Sam to visit the Sand Dunes. Enjoy the camel safari and then return to the hotel for a night stay in Jaisalmer. Enjoy the day at leisure. In the evening take a ride on the camel cart to visit the sunset point. In the evening, enjoy participating in the fold dance around the bonfire. 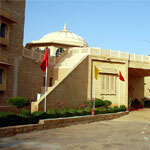 Gorbandh Palace is a HRH heritage hotel located at Jaisalmer (Rajasthan, India). Jaisalmer is known for its proximity to Sand Dunes. Hotel Heriatge Inn is a 3 Star property of Carnival group of hotels. This hotel is located on the main road to Sam & Amarsagara in Jaisalmer (Rajasthan - INDIA) at a distance of 2 kms from the Airport and 3.5 kms from the Railway Station.